Leicester trio Jamie Vardy, Riyad Mahrez and N'Golo Kante have been named on the six-man shortlist for the PFA Players' Player of the Year award. They are joined by Arsenal midfielder Mesut Ozil, West Ham midfielder Dimitri Payet and Tottenham striker Harry Kane. Kane is also in contention to retain the Young Player of the Year award he won 12 months ago and is named alongside Spurs team-mate Dele Alli. The winners for each category will be announced on Sunday, 24 April. Leicester's remarkable rise to the top of the Premier League, seven points clear of Tottenham, has seen three of their best players rewarded for their fine form this term. 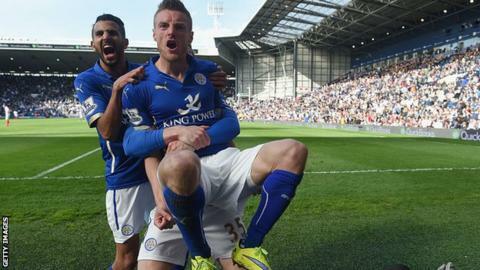 Vardy has scored 21 league goals and made six assists, while playmaker Mahrez has contributed 16 goals and 11 assists. Frenchman Kante has earned widespread praise for his performances as a defensive midfielder, making more tackles (146) and interceptions (134) than any other player in the Premier League this season. England striker Kane is the top-flight's leading scorer with 22 goals, German Ozil has provided a league-leading 18 assists and Payet has enjoyed a superb debut season, scoring nine goals. The award was won by Chelsea midfielder Eden Hazard last season. Everton duo Romelu Lukaku and Ross Barkley, Stoke goalkeeper Jack Butland and Liverpool midfielder Philippe Coutinho have all been named on the Young Player of the Year shortlist. Last year's Women's Players' Player of the Year, Chelsea's Ji So-Yun, is in the running for this year's award, alongside team-mates Hedvig Lindahl and Gemma Davison, Sunderland's Beth Mead and Izzy Christiansen of Manchester City.